Freedom and Flourishing: Can we identify the characteristics of national ideologies that promote economic freedom? Can we identify the characteristics of national ideologies that promote economic freedom? I have had to revise my views about the characteristics of national ideologies that promote economic freedom after undertaking some research using World Values Surveys (WVS). I used data from surveys conducted around 2000 and during the first decade of this Century. The set of questions I thought would be most relevant relate to such things as attitudes to competition, potential for hard work to lead to success, wealth accumulation, income inequality, government ownership and increased government responsibility. So, I spent a few hours standardizing data in order to average it and derive an index of economic policy attitudes. The next set of questions that I thought would be relevant relate to confidence in major companies and confidence in organisations that tend to interfere with markets (the government, political parties, parliament and civil service). I thought that economic freedom was more likely to increase in countries where there was greater confidence in big business than in government agencies. Another question that I thought might be relevant asks people to choose from four options what they consider to be the most important aim for the country over the next ten years. The options are: a high level of economic growth; strong defence forces; people have more say about how things are done; and trying to make our cities and countryside more beautiful. I thought that people who favoured a high level of economic growth might possibly tend to favour increased economic freedom. I wasn’t over-confident about that, however, because people who claim to be in favour of high economic growth often seem to me to be inclined to espouse hair-brained ideas for government interventions to advance that objective. Finally, I thought a question relating to opinion about scientific advances might be relevant. I wasn’t sure whether people who are confident about scientific advances might be more prone to think rationally about economic policy, or whether they might be prone to scientism and have an irrational attachment to government planning. Anyhow, I also included a variable based on the percentage in each country who think that scientific advances are likely to help mankind. The regression model sought to explain change in economic freedom over the period 2001 to 2011 in terms of initial economic freedom, as well as the four variables discussed above. My rationale for including the initial level of economic freedom is that the higher the initial level of economic freedom, the more favourable ideology must be in order to produce a further increase in economic freedom. The estimated coefficient on that variable was negative, as expected. 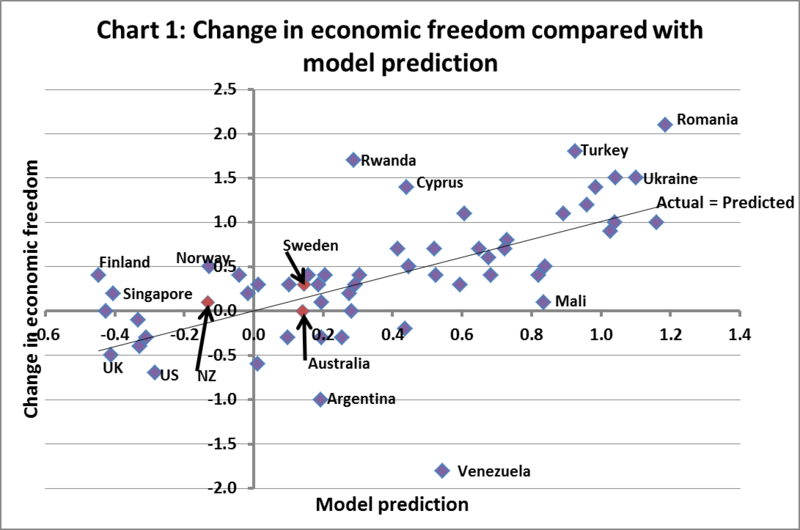 Changes in economic freedom predicted by the model are compared with actual changes in economic freedom in Chart 1. The outliers in the chart are of some interest because they show the importance of factors other than the prevailing growth ideology of the population – an obvious factor is political leadership – in causing changes in economic freedom. The results support the view that the anti-economic freedom policies followed in Venezuela and Argentina, for example, do not have much support from the populations of those countries. The results of the regression analysis suggest that a country like the US or Australia with a relatively high level of economic freedom (i.e. a rating of about 8) would need to have prevailing attitudes toward economic growth that are around average (relative to the countries included in the analysis) in order to avoid a decline in economic freedom. That may actually be less likely to happen than you might think because people in countries like the US and Australia tend to give lower priority to economic growth than do people in countries with lower average income levels. I will discuss the implications in my next post.